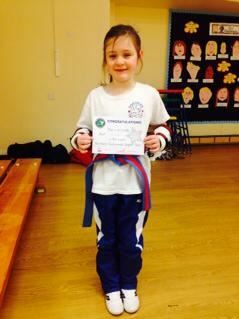 Caitlin is our first student to be awarded her Platinum Super Star certificate ! Our superstar program runs in all our breakfast and after school clubs. Each class a student will be awarded a superstar sticker for outstanding achievement in the following areas. Behaviour , stances , patterns, blocks , kicks and future Black belt.once they achieve 6 stickers they receive a Superstar Certificate red , 6 more silver , 6 more gold then 6 more Platinum !! This encourages and rewards all our fantastic students ! !